Keith O’Rourke is a born and raised Albertan. Growing up in Calgary, Keith developed a love for music fostered by many gifted teachers. It wasn’t until the early years of his undergraduate program in music that he discovered and was drawn towards the improvisational nature of jazz music and the freedom of expression it allowed. Already halfway through a classical saxophone Bachelor in Music Performance degree, Keith decided to finish his studies as a classical musician before setting sights on becoming an exceptional jazz saxophonist. Upon graduation, Keith knew that in order to progress rapidly he needed to immerse himself into a voracious jazz scene. This led Keith to move to London, England for a year, enjoying the opportunity to see many of the worlds finest jazz artists as they came through London on their European tours. Many of the artists would put on sponsored workshops to help promote their concerts. Both listening to these artists in concert and the advice they gave in the workshops played a huge role in shaping Keith’s performance and compositional style. After his time in London, Keith returned home as a much more accomplished musician. Still not satisfied, he applied and was accepted in 2001 into the prestigious Banff International Jazz Workshop. In Banff, his peers were many of the upcoming jazz artists who are now making waves on the jazz scene, such as Aaron Parks and Chet and Jim Doxas. Even more important was the one on one time that the intimate learning environment provided with some of the leading jazz artists serving as faculty. 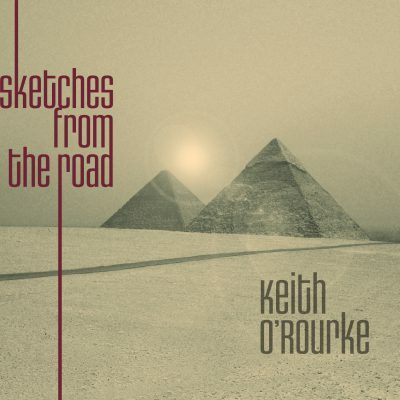 This in depth learning from Joe Lovano, Dave Douglas, Kenny Werner and others was a huge inspiration for Keith. Now much more confident in his skills, Keith felt that he needed to put his practice into regular performance. Keith spent the better part of the next seven years performing nightly aboard cruise vessels honing his skills in all styles including Jazz, Blues, R&B, Classical, Folk, Country and more. Since returning to Calgary in 2008, Keith is now a recognizable figure in the jazz community and Keith adds his own unique voice to many projects. He started playing the occasional gig with the Prime Time Big Band and put together a quintet to perform the music of his influences. The occasional gig turned into full membership with the Prime Time Big Band and led to many other calls including the Calgary Jazz Orchestra, the Calgary Creative Arts Ensemble and theatre work for Stage West Calgary. He is currently leading his own quartet (the Keith O’Rourke Quartet) and co-leading a quintet with fellow Calgarian, Andre Wickenheiser in the Past Present Quintet. He has been involved with numerous projects and played in concerts with nearly every major jazz artist in Calgary. Such as Al Muirhead, Jim Brenan, Kodi Hutchinson, Pat Belliveau, Mark DeJong, Tyler Hornby, Jon Day, Jon McCaslin, Johnny Summers, Jeremy Brown, Gerry Hebert, Rubim De Toledo, Keith Smith and so many more.